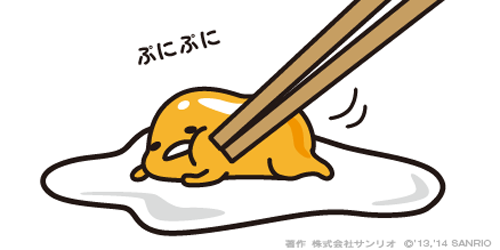 Have you heard about Gudetama, the new addition to the Sanrio team? Gudetama's name is a combination of the Japanese words "gudegude" ("dead drunk" says my dictionary) and "tamago" (egg). I think it's reflected pretty well in the illustrations. Like most Sanrio characters, he is kind of adorable but I think he is a bit stranger than the rest. Even so, he earned his own themed character cafe and my friend Natalie and I went to go check it out at Village Vanguard Diner in Yokohama. The line wasn't terrible. They said that the wait would be 2 hours but we were seated and served within closer to an hour and a half. The cafe was really small too so I was a little surprised by how quickly it moved. Like the ever changing Guest Cafe in Shibuya Parco, the staff allowed us to place orders while we waited in line so that food would be ready shortly after we were seated. The Gudetama merchandise is so cute! I ordered the eggs benedict (no bacon) because I am vegetarian so I was limited in options. I was sad that my food didn't have a face so I lived vicariously through Natalie whose taco rice did. I also took these silly vine videos. The walls were really cool! I thought the food was pretty good and the price wasn't too much either. I was happy I got to go to this cafe! Natalie and I had a lot of fun. You probably noticed that I wrote this blog post in English and Japanese. I want to do that for all of my posts going forward so that I can continue to improve my language skills. I don't think I could have written this entry a few months ago so I am feeling pretty good. That being said, I'm sure there will be some awkward or silly sentences in there because I am still learning. If you notice anything that seems super off, please let me know and politely correct me so that I can continue to learn! I will really appreciate it.